You told yourself it was temporary and you were going to figure out a way to repay your loans and avoid what you’ve seen others do. You knew the dangers of getting out too many loans because you may have seen your family and friends become buried under an avalanche of repayments. Unfortunately, perhaps you now realize you bit off more than you can chew. It can happen to anyone as even when you’re conscious of the pitfalls you can still fall in them. It's a surreal feeling that almost plays out in slow motion. Time slows down, and you suddenly come to terms with the fact that you need to change your lifestyle if you are to climb out of this hole. Not to worry however because modern climbing gear in the form of settlement schemes, and advice on cutting back and managing your finances is on hand. Like a family tree, your expenditures are all connected. Your food bill is connected to your electricity because you put the food in the fridge to keep it edible. Your electric bill is linked to your heating bill if you have a central heating system that’s digitally operated. The heating system uses water that’s heated and circulated around your home, and so on. Sit down are on a laptop make a table of all the expenses that you incur every month. The largest should go in their own separate group as these will be priority needs such as those mentioned. The secondary expenses will be your usual maintenance bills such as maintaining your vehicle like paying for gas and repairs, and other bills such as home repairs or clothes. The third grouping shall be luxuries that don’t really affect your life in a negative way should they be cut. With this budget laid out in front of you, figure out what you need not what you want. Begin to cut back until you see a net positive saving. Sometimes it can get too much, and you could end up losing it all if you don’t act responsibly. Even if debt consolidation is off the table, you still have options. It may be termed the nuclear decision, but when you’re being suffocated by the mountain of debt, it's only right you do try to cut loose those you owe. Go to debtsettlement.co and check out the various options you have for debt settlement programs. This style of repayment takes a lot of negotiation with and on the part of the company you decide to go with. They’ll figure out a way to come to a settlement figure that will be the lump sum amount you’ll pay to all your creditors. You will end up paying less than what you owe. However, the terms may be strict, and you may need to pay for processes such as lawyer fees and payment to the settlement company. It's definitely a way out and shortening the length of time you’re under the burden, but you need to be ready to part with the lump sum in order to do so. Riding the avalanche wave of debt can be tricky, but it can be done. 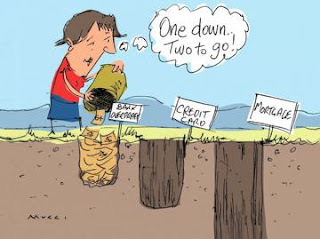 There’s always a way out for those who are prepared to change their lifestyle and ultimately bite the bullet and pay the lenders off quickly.